Vembu is now getting ready to announce their next new release that's currently doing the rounds on social media. Vembu BDR Suite, the flagship product of Vembu, is now all set to see the next new version -- v3.9.1. This latest release has quite a few new features of note. And ahead of the release, we have Mr. Nagarajan Chandrasekaran, Director of Product Management to share with us the efforts that have gone into the making of this much anticipated version and explain how it's expected to garner attention among IT administrators and data center owners. VMblog: For the past couple of months, how has the atmosphere been at Vembu working towards unveiling the new Vembu BDR Suite v3.9.1? Nagarajan: At Vembu, the ambiance is in high spirits and we are working tirelessly towards releasing our next version- the Standard Edition of the Vembu BDR Suite v3.9.1 that will be of great benefit to the Small and Medium businesses. VMblog: Well, that's great to hear! So what's under the hood with this latest version? What will your customers and prospects find valuable to learn more about? Nagarajan: The new Standard Edition of the Vembu BDR Suite v3.9.1 will be a very sophisticated solution for VMware and Hyper-V at an affordable cost. The edition comes up with many exciting functionalities like agentless VM backups, Quick VM recovery, instant file recovery, granular recovery for MS Applications that would be a robust solution for any Small and Medium Business. VMblog: Can you throw light on some of these exciting functionalities that have been requested by IT admins which are addressed in this upcoming release? Nagarajan: With the upcoming new version, we are extending support to VMware vSphere 6.7 and many enhancements. IT administrators and current users of the Vembu BDR Suite can now continue using the new version and avail support to this latest version of VMware vSphere 6.7 and enjoy many advancements of existing functionalities from the existing version of the Vembu BDR Suite for a robust solution. VMblog: How has the response been to the latest version 3.9.0? Are there any key enhancements that were made to the previous version? Nagarajan: Our customers are happy with the way the recently released version 3.9.0 has worked in their environments. We further have worked towards improving the stability and performance of the current version. Along with the additional support to VMware vSphere 6.7, Vembu users can expect a better user experience through the current features with version 3.9.1. VMblog: There have been a few conversations claiming Vembu BDR Suite would be offering storage-level snapshots in the upcoming releases of this year, and it appears that the functionality will be the #1 awaited capability among IT administrators. What do you have to say about it? Nagarajan: Yes, you are right. We've been getting multiple requests from our enterprise customers on storage level snapshots. To begin with, we are working towards providing the capability with NetApp and HPE. We will come up with a fully functional workable solution by the end of this year. VMblog: It looks like the year 2018 has been very promising for Vembu. And the Vembu user group has been on a significant rise as well. What should users expect from your flagship offering - the Vembu BDR Suite - by the end of the final quarter? Is there a specific message that you want to convey to Vembu enthusiasts? 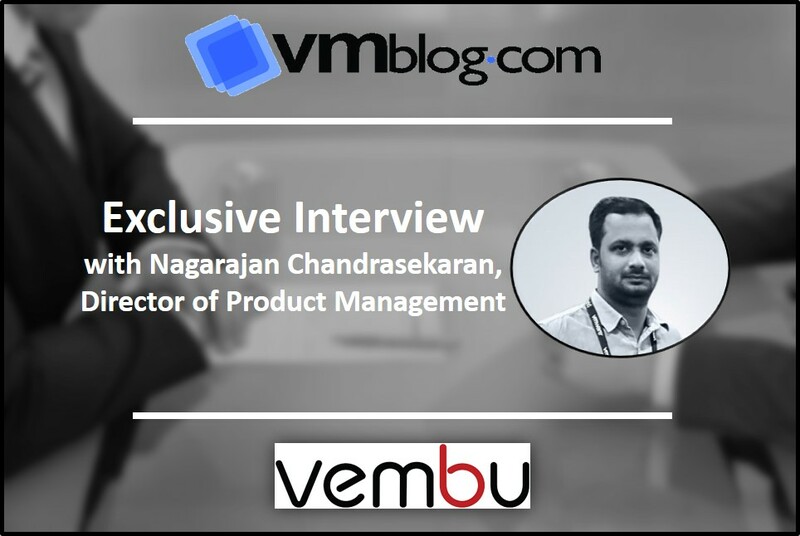 Nagarajan: Vembu believes in a simple & workable solution that tackles complex data management head-on. IT Admins at the end of the day, would want to work on a simple software that provides backup, recovery, replication and reporting features. The Vembu BDR Suite does that exactly but with better stability and performance, thus simplifying data protection.